Some drivers are experiencing sticker shock at the pump as the price of gas has jumped significantly over the past couple of weeks. AAA expects the problem to only get worse, so they’re recommending tips to help you conserve. AAA East Central’s Herman Jenkins says crude oil, refinery maintenance and summer-blend gasoline are some of the factors behind the higher gas prices- and it’s only expected to get worse as we get further into the summer travel season. Minimizing last-minute braking. Be alert for slow-downs and red lights and coast up to them, if possible. Drive smoothly, avoiding “jackrabbit starts.” The faster you drive, the more fuel used. Remember, however, that traveling slower than traffic flow can cause a safety hazard. Don’t haul extra weight in the passenger compartment or trunk. Reducing extra weight can save up to 2% fuel economy for every 100 lbs. removed depending on the weight of the vehicle. Read your owner’s manual for the recommended fuel for your vehicle. If it says “regular unleaded gasoline” is recommended, using anything else is a wallet-drainer, and if it says “premium required” you must use it for proper vehicle operation. However, when your manual says mid-grade or premium “recommended,” read carefully; sometimes it indicates you can use regular unleaded to save money, but you may experience reduced power and/or a small reduction in fuel economy. For families that have more than one vehicle, select the most fuel-efficient vehicle that meets the task at hand. Don’t automatically jump into the SUV or truck when the sedan will do. Use the most energy-conserving vehicle you own as much as possible. Consolidate errands to cut down on driving and number of miles driven. Plan your route and look for a location where you can take care of all or most errands. Avoid excessive idling. Parking your vehicle and walking into the store or restaurant instead of using a drive through will save gas, and could improve your health. Choose a shopping center where you can park and walk to most of the stores you need. Properly maintaining your vehicle is critical in reducing gas use. Under-inflated tires can cut fuel economy by up to 2 percent per pound of pressure below the minimum recommended level. Worn spark plugs and dirty air filters also increase fuel consumption. In Butler County, prices are inching close to $3/gallon and have gone up about 50 cents since January. 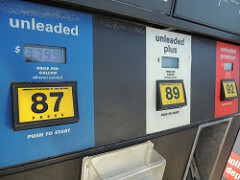 The post Gas Prices Keep Climbing; AAA Offers Cost-Cutting Tips appeared first on ButlerRadio.com – Butler, PA.